WHOA Scuba Diving is born. In the veteran non-profit world and the VA system, there are multiple groups that benefit from sports or activities as therapy. The camaraderie and the fellowship alone are utmost therapeutic, and the physical activity challenging in a good way. August 25, 2018, was our kick-off for the WHOA Scuba Diving Club! We are a good deal away from being able to call ourselves scuba divers, but we’re on our way. Special thanks to Chris and Thomas, managers at Dive N’ Surf, and to our adventurous heroes for making this happen. 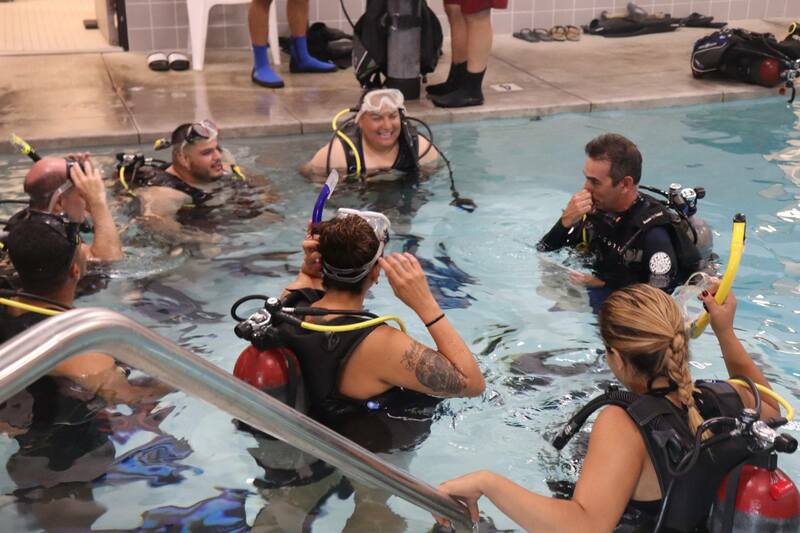 August 25, 2018, was our kick-off for the Wounded Heroes of America Scuba Diving Club! We are a good deal away from being able to call ourselves scuba divers, but we’re on our way. This wasn’t really our idea, but when a good idea comes along and turns into an opportunity, you have to “seize the moment” as they say, so we did. On May 5, 2018, the Redondo Beach Police Department had its inaugural surf contest. The staff wanted to have a veteran presence, and WHOA had the good fortune to be invited. I explained to the coordinator that none of our vets knew how to surf, and she said, “Doesn’t matter, don’t worry.” Perfect: our kind of contest. She went on to say, “Just go to Dive N’Surf, see Chris, pick up your wet suits, and come have fun.” Great start. So, we did just that, and in the process met Chris and Thomas, managers at Dive N’ Surf. They hooked us up with wet suits, hungout with our vets, and formed friendships with a lot of us. We invited them to our Golf Tournament that same month and they came, and I can safely say they are better at golf than we are at surfing—but not by much. Scuba diving sounded a lot easier, so I pitched the idea to the most adventurous guys and ladies of our organization, and they loved it. The maximum number of people we could get in the pool at once was eight, and we did just that. For the group’s first time breathing underwater, it was a great success; now everyone wants to be a diver. In the veteran non-profit world and the VA system, there are many groups that use different sports or activities as therapy. The camaraderie and the fellowship alone are very therapeutic, and the sports are challenging in a good way. They also have every sort of sport, for every level of wounded vet. We have escorted blind vets fly fishing and have had blind golfers in our tournaments. The problem with many of those opportunities, though, is that they are often few and far between, and not always with the same vets, making it difficult to form strong fellowship. We, however, strive to operate on consistency, inclusion, and constant contact. It’s how we’ve built an extended family of vets, and it’s how we find ourselves having to shop for two hundred kids at Christmas. We meet for dinner as a group every two months; we have monthly financial classes; and we have lots of events during which our vets can volunteer and participate, including our annual golf tournament, our Mardi Gras party, our Day at the Ranch, and our Operation Santa. We’re always doing something,and now we’re creating our own Scuba Diving Club. When the opportunity to go scuba diving came our way, it got an enthusiastic YES. We live in Southern California, home to some of the best beaches and beach communities in the world. So, when Chris and Thomas from Dive N’ Surf said, “Hey, dude” (which is how we talk now that we’re divers) “let’s get these guys in the water!”we were all about it. We have just started our Scuba Diving Club. There is something very true about water: it is calming and therapeutic, and we have this great playground in our backyard. It just makes perfect sense. We are very excited and are looking forward to sharing more stories of how things are developing. Also, we could use your help! Scuba diving is not cheap, and we will have to find funding for this program. Please help us get this program off the ground. Contribute to our Scuba Club today. It’s going to be a winner.